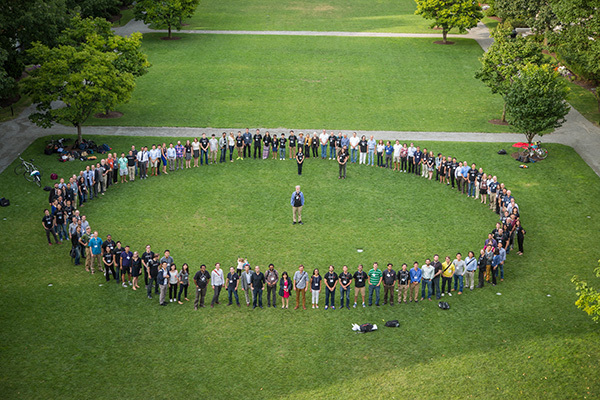 George Church's 60th Birthday party celebration group photo. Mentors, lab alums, current members, and family members are in chronological order clockwise starting from 12 O'clock. Click on the photo on the left for all of the official and contributed photos from the event. Friday night, George finds himself in the middle of a fake Cat Genome Symposium talk that turns out to be his surprise party. Former student, Fritz Roth, is giving the dry welcoming remarks when it slowly starts to go off the rails. Current lab members watch from another location within the building and join the party afterwards. Pete Estep and Martha Bulyk give answers to the GC Trivia Game and award prizes. Cutting out an audio problem makes for a slightly abrupt ending. GCAT60 Spoof video "Weekend at George's". Postdoc Dan Mandell introduces the video made by lab members in honor of George's birthday that explores the question "How would we get by without George around?" A special tribute to George sung to the tune of "The Elements" followed by Happy Birthday. Margo Monroe (vocals), Joyce Yang (keyboards and songwriting), Luhan Yang(ukulele), and Ellen Shrock(violin). George cuts the cake for his 59.97 year birthday. A big thanks to all of the speakers and everyone who made this fun and possible. Official Photos and Videos were shot and produced by Colin Beatt.